Posts tagged "Vitamin D Deficiency"
A little over a month ago I had the privilege of being able to guest post over at Future.Flying.Saucers. Have you ever gone through something that all the while challenging, you were still boasting in the Lord? So have I. This guest post was about a recent struggle I went through dealing with chronic pain that at one point was thought to be due to rheumatoid arthritis. Well, I am excited to announce that since this post went live, my diagnosis was found to be wrong. Oh, what a thrill! Instead of a life long auto-immune disease, I have a vitamin D deficiency. To fix this I simply need more outdoor time, more milk, and a daily vitamin. In a few months I should be feeling a lot better! I still have fibromyalgia, but I will still be boasting in the Lord while I deal with that chronic pain and have faith just as before. Unfortunately, due to illness I was unable to share this post with you when it originally published and haven’t had a chance to do so until now. First I had mild case of chicken pox. They cleared up really quickly, but I soon became really sick in other ways. Originally I assumed it was from the medication I took to help with the pox, but last week during a visit to the emergency room I found out I have a blood clot in my ovary. Yesterday, I had another visit to the doctor due to an infection I have come down with due to a high dosage of blood thinners. Now, I may be possibly facing surgery to remove the ovary if the doctors decide it is necessary. But you know what? That’s okay. God’s got this. You will STILL find me boasting in the Lord! So now, enough of that… Head on over to Future.Flying.Saucers and see the original post! You will LOVE this blog, even if you don’t homeschool. If you teach children’s church or Sunday school, you will really appreciate her Sunday school lessons. She is an honest, down to earth, tell it like it is woman of God. 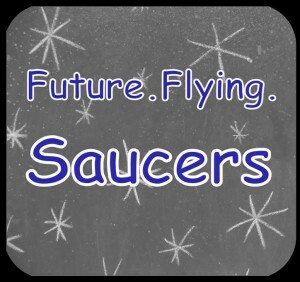 So be sure to “Like” Future.Flying.Saucers on Facebook so you won’t miss a thing. After you’re done over there, come on back and let me know if you’ve ever gone through an illness, no matter how minor or major, where you received one diagnosis only to find out later it was something else… Did God teach you a lesson in the process? I’d love to know!